If you’re visiting Cairo and Egypt, chances are you’re doing it because of the Pyramids of Giza on the outskirts of Cairo, and rightly so as they genuinely are a wonder of the world. 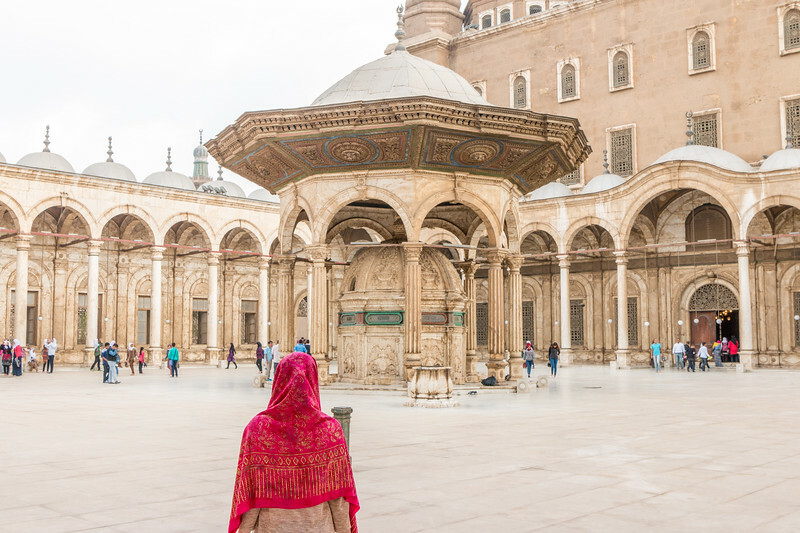 Yet behind the chaotic metropole that is Cairo, there are many things worth seeing and doing that can keep you busy for a few days and can perfectly complement your trip to Egypt before venturing further afield. 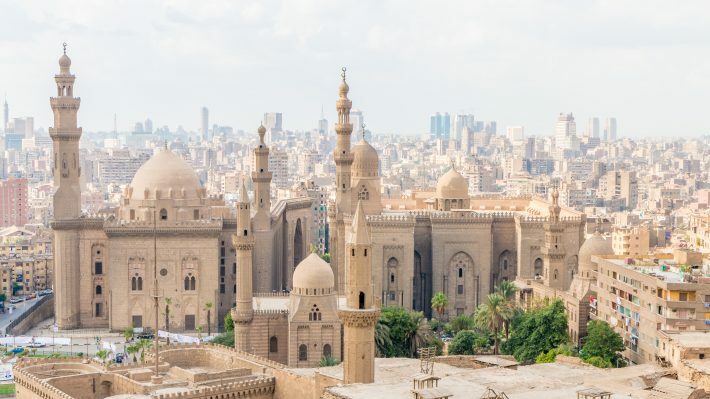 A good example of how the city can be an interesting place to visit is an area known as historic Cairo, that with its many monuments and attractions dating from the 7th to 20th centuries was recognized as a UNESCO World Heritage Site. Let’s look at our 7 suggestions of things to see and do in Cairo. After the Giza Complex, the Egyptian Museum in central Cairo is probably the most visited place since it’s the perfect match history-wise with its massive exhibition of Egyptian antiquities. The Egyptian Museum houses over 100 thousand artifacts covering 5000 years of Egyptian history and one can spend hours just looking at them, but the main highlights are what was found in the intact tomb of Tutankhamun and the Royal Mummies (separate ticket required). There is a new museum called the Grand Egyptian Museum under construction not far from the Pyramids and many artifacts will be moved there once it’s completed, including some of the most famous ones. Worry not, there are thousands of other pieces that have never been displayed that will remain at the old Egyptian Museum, most likely after it undergoes renovation. 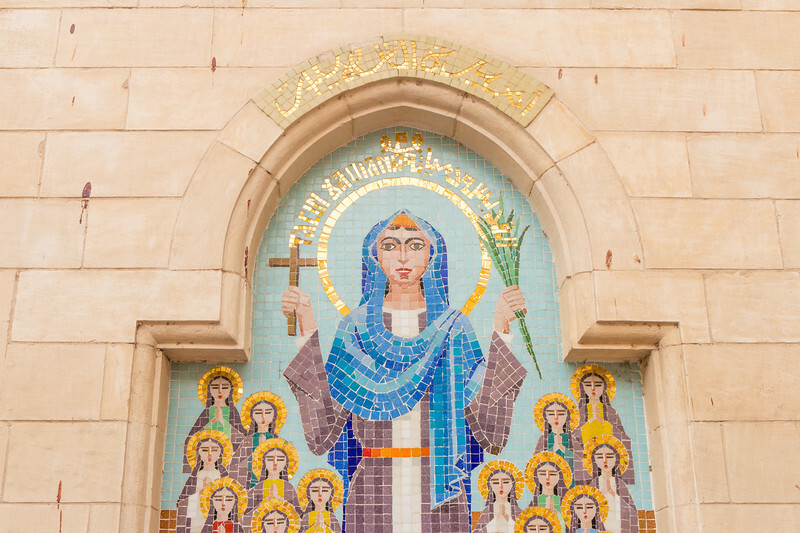 The city has an immense history and Coptic Cairo is no exception as it represents Egypt’s Christian past with many churches, a museum, and other ancient monuments. Highlights include the Hanging Church, whose name comes from the fact it was built on top of an old Roman fortress, the very old Church of St. Barbara, and 9th century Jewish Ben Ezra Synagogue, just to name a few. Bab Zuweila is one of the few remaining gates of old Cairo and despite being an iconic sight of the city it doesn’t get that many visitors. 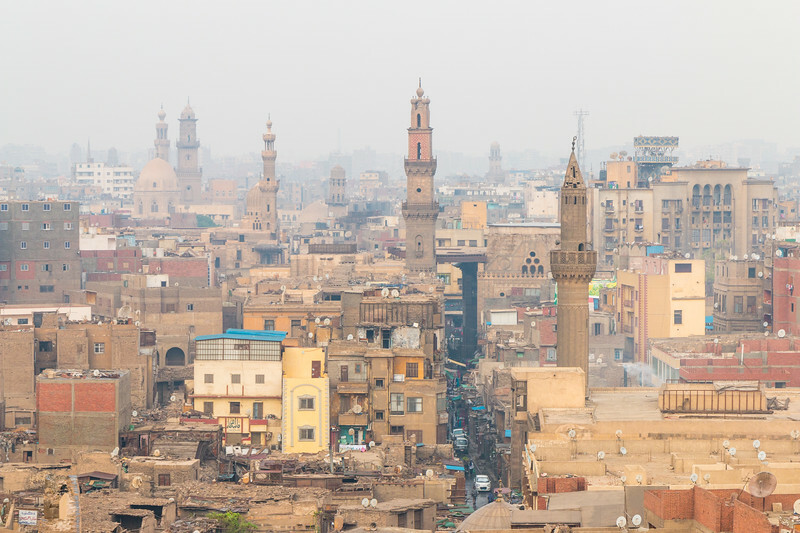 The two minarets of the gate offer great views over this part of Islamic Cairo with many other minarets and towers seen in the distance. Definitely worth a visit and the climb to the top. There are other things to see in the area as you can see in the photos, starting with the beautiful Mosque of al-Muayyad right next to the gate. 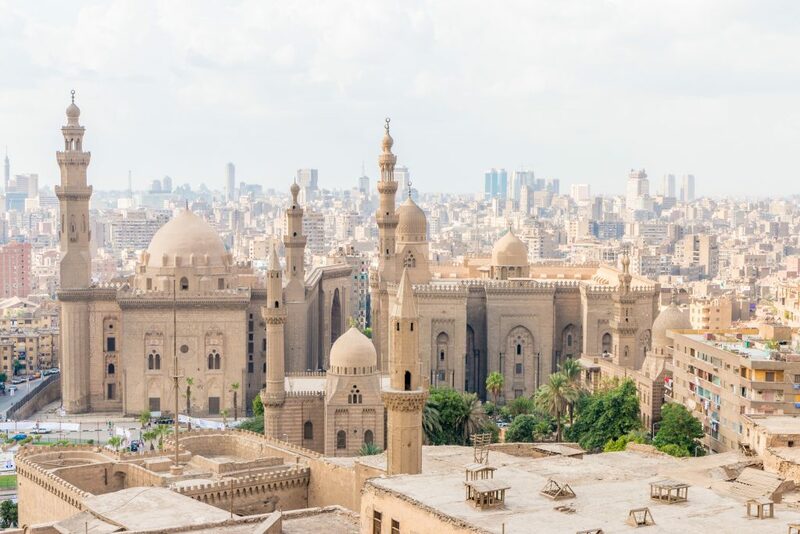 The Cairo Citadel is another important historical hotspot with mosques, museums, and magnificent views of the city that will keep you busy for a few hours. 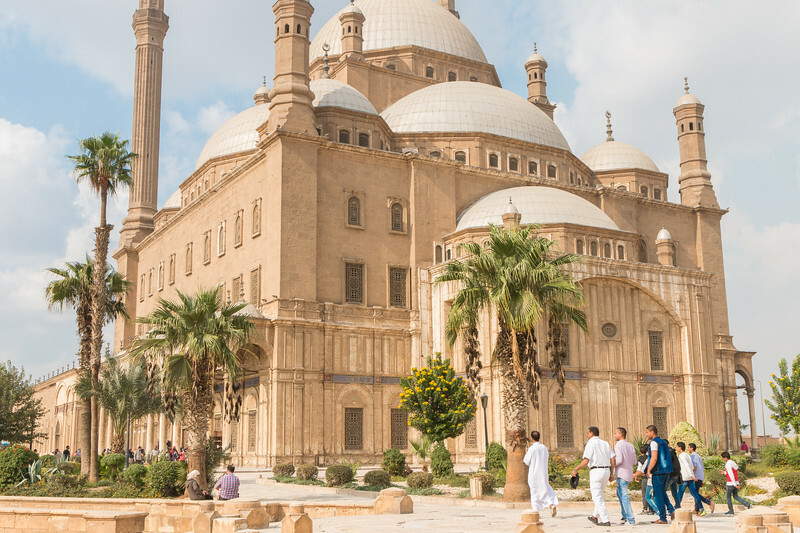 The main highlight of the Citadel is the Mosque of Muhammad Ali, one of the most impressive in Cairo, firstly, because it dominates Cairo’s skyline at the top of a hill, and secondly, because of its beautiful and rich interiors. The museums are also worth checking out, namely the National Military Museum. 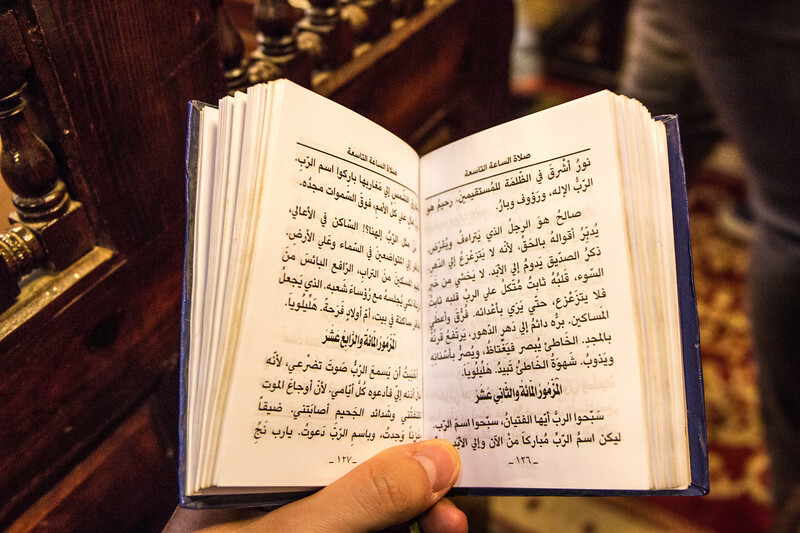 Khan El-Khalili is a major souk and a mandatory stop of any visit to Cairo. 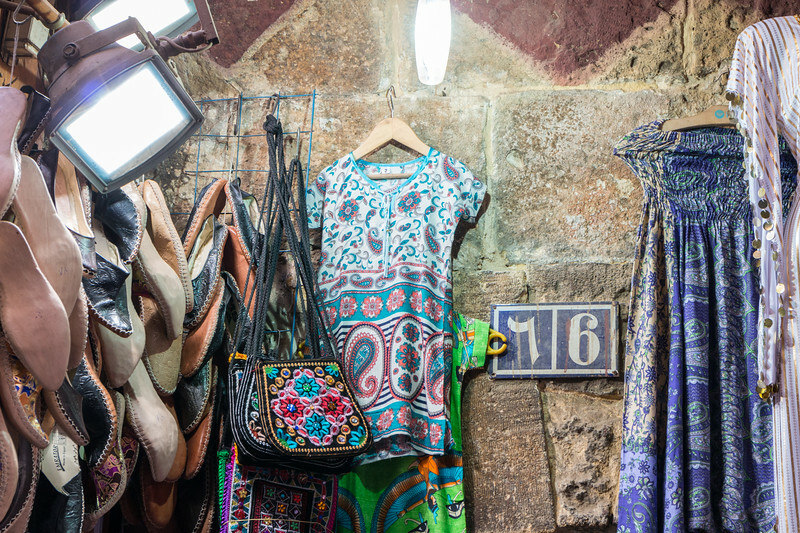 With a history dating back to the 14th century, modern day Khan El-Khalili is a market with many and diverse shops where you’ll be able to find all sorts of things imaginable such as spices, perfumes, gold, clothes, collectibles, and touristy stuff, among a countless number of other items. You’ll find an unusual shop where you least expect. 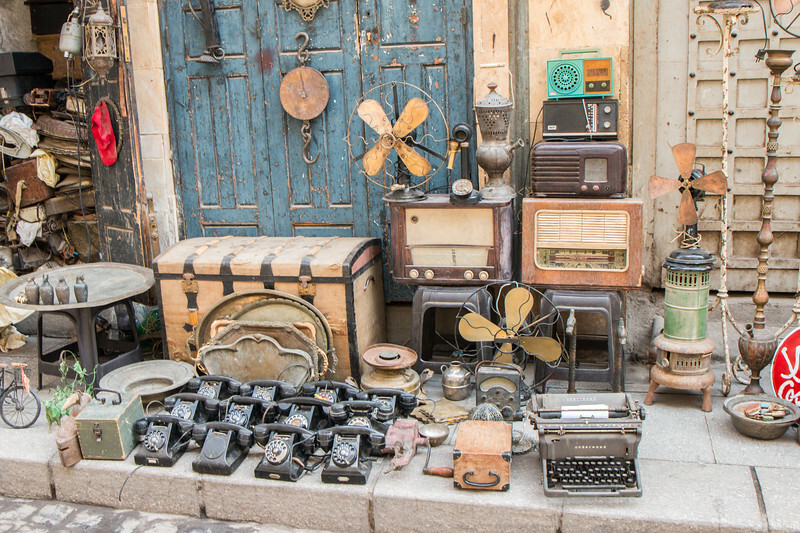 Even if you’re not buying anything, it’s a really interesting place to visit and to discover more about the life of a Cairene. 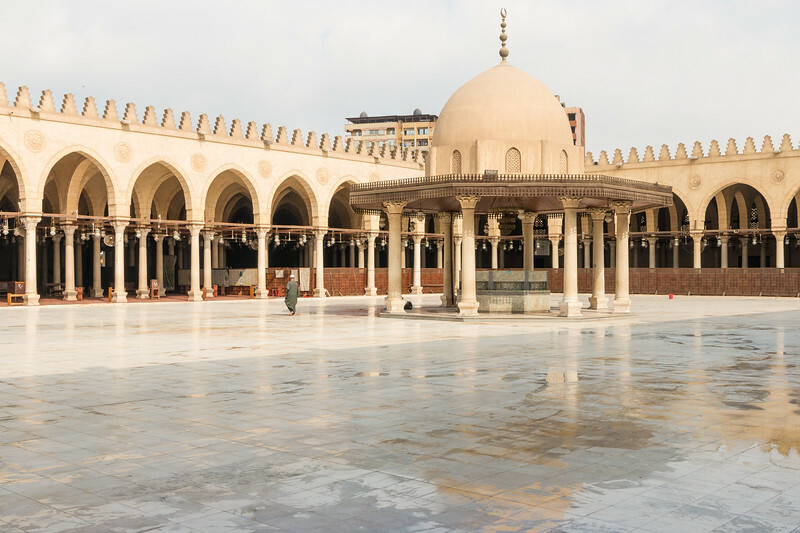 Cairo has many historical mosques, probably more than you can visit, and some are really worth seeing as they are fine examples of Islamic architecture – a joy to the eye. 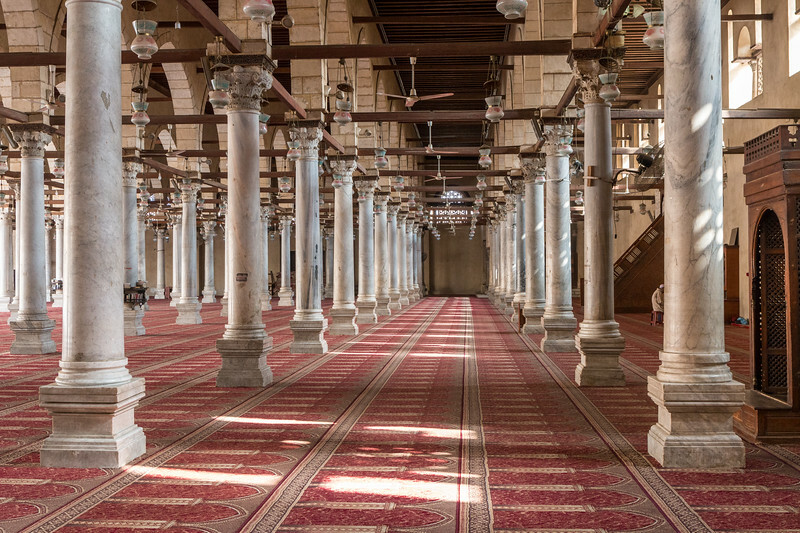 Two mosques we recommend visiting are the Mosque of Amr and the Mosque of Ibn Tulun, with the latter being the oldest preserved mosque in Cairo. The Cairo Tower is the last and most modern attraction in our list of things to see and do in Cairo. At 187 m, this concrete tower that resembles a lotus plant dominates the Cairo skyline and is the tallest building in Egypt. There is a rotating restaurant with good food (pricey for Egyptian standards but still good value) and an observation deck at the top with commanding views over the whole city. Entrance is paid, even if you’re going to the restaurant, which should be booked ahead. Cairo is a big city and traveling around is not always easy. This being said, there is a cheap public transit system available with metro and buses that, while not very widespread, are convenient to get to certain locations. The most straightforward way to go somewhere is to get a taxi, which is both cheap and flexible. The main thing to remember is to agree on a price beforehand because most cars don’t have a meter and it reduces the possibility of a scam. Driving on your own should not be considered as it would be a waste of time! Ideally, you should travel to an area and then explore on foot as there are many things to discover at every corner. Are you planning to visit Egypt and Cairo? What’s your top pick? Let us know! When I was little I always wanted to become an archaeologist. I never did but still love ancient artifacts do I think I would love the museum a lot. Some great tips! Same with us! Certain civilizations are incredible and fascinating. This is great, we are hoping to visit this spring! the Pyramids have always been a bucket list item for me, but its nice to know what else we should be doing while we visit! thanks! Great! Let us know if you have any questions. We visited quite a lot of Egypt. Crazy traffic! Honking all the time. The pointy thingy is nice yet there’s so much more! All such wonderful suggestions. Reading this and looking through you wonderful photos took me back a few decades ago when I visited Cairo with my parents. It was such a magical adventure. 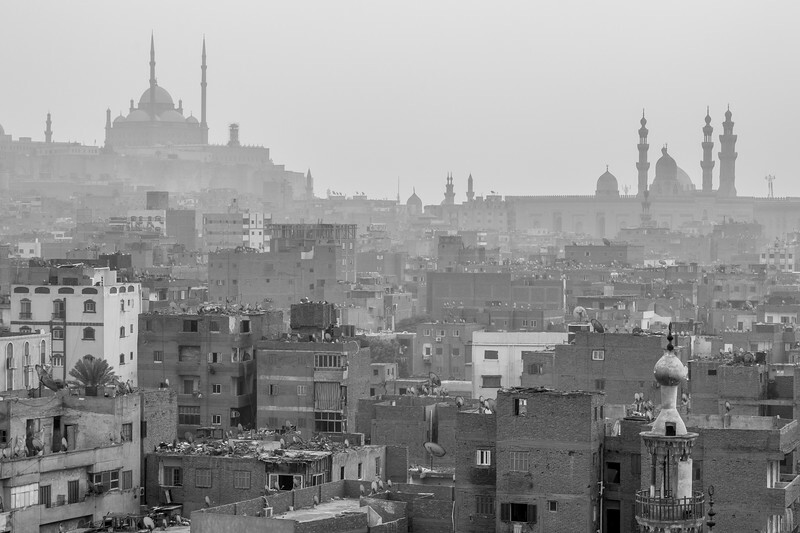 In late 2016, I visited Cairo for the first time, as I was filming a project with CNN. I see the pyramids or any of these places, except Khan El-Khalili. I’d say I have many reasons to go back to Cairo. I missed so much! That’s cool! Must have been a great experience. Cairo looks so interesting and beautiful! I would love to visit sometime. Thanks for sharing so many ideas for things to do besides the pyramids–I would really like to visit Cairo Citadel, the Mosques and Cairo Tower! You’re welcome. Hope you visit Cairo soon! Hi, thanks for Cairo recommendations. It seems this city is really worth visiting, even for more days. I would love to see Mosque of Amr and the other mosques! Good to know there is something beyond pyramids too! The Cairo citadel is impressive and GRAND! I am keen to do the museums there. I would definitely never drive in Cairo. I was always so impressed with the taxi driver’s ability to navigate it all. The traffic patterns are a thing of mystery to outsiders. Cairo is a fantastic place to explore though. I saw many of the things on your list and had a really nice time there. Indeed. It’s pure madness to drive there! Egypt has been on my bucket list for as long as I can remember! I was really in to Egyptology and though I’m not really a museum person, I know that the Egyptian Museum will captivate me for hours when I finally get to visit. Thanks for noting these other attractions too because I wasn’t aware of all of them. The museum is super interesting even though the displays are not as modern. The new museum will be amazing! You’re very right. The pyramids alone are worth the trip, but having something extra to see also helps for a better experience. And Egypt has a lot more to offer outside Cairo! The new National Museum of Egyptian Civilization, Souk al Fustat, Cairo Downtown, El Mokattam Hills, Kasr el Nil Bridge, and so many places to see! 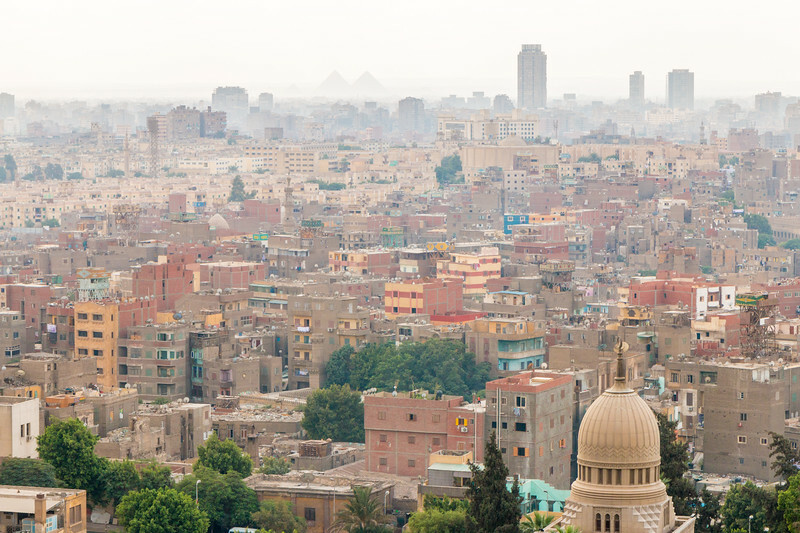 Plenty to see and do in Cairo. Most don’t get to see anything other than the Pyramids! Love your photos, the contrasts and perspectives. Simply stunning! My daughter and I are planning on a trip to Egypt in Feb. What clothing would you suggest? Long and loose clothing is recommended. Nothing too short and you’ll be fine.